Bugatti is celebrating a world premiere at the Geneva International Motor Show: the French luxury brand is unveiling the Bugatti Chiron, the most powerful, fastest, most luxurious and most exclusive production super sports car in the world. The Chiron is the latest generation of the ultimate super sports car and is a completely new development. The sports car manufacturer from Molsheim, with its long tradition, has taken the unique features of a modern Bugatti to a new level and developed a high-performance machine that has become significantly better in every respect. With a power output of 1,500 HP, unprecedented for production vehicles, an exceptionally high torque value of 1,600 Nm between 2,000 and 6,000 rpm and a wide variety of technical innovations, the Chiron sets new standards in every respect. The Chiron is therefore very well-positioned to become the next world speed record holder and reach a maximum speed significantly above the record currently held by Bugatti. The manufacturer has limited the maximum speed of the new car to 420 km/h for road use. The Chiron is to be built at the company’s headquarters in Molsheim. Only 500 of these exceptional cars are to be produced. The basic price is €2.4 million net. Currently, advance orders have been received for one third of the total production run. The first vehicle is due to be delivered to a customer this autumn. The Bugatti Chiron is the world’s first super sports car to bring 1,500 HP onto the road with a torque of 1.600 Nm at 2,000 to 6,000 rpm with tremendous effectiveness, extremely high safety levels and unprecedented comfort. This is the result of the legendary and unique eight-litre W16 engine that has been newly developed by Bugatti. In combination with the four new, larger turbochargers that are controlled by the Bugatti two-stage turbocharging, an innovation that Bugatti is introducing, and a large number of other technical refinements and innovations, maximum performance is available constantly and can be easily controlled at all speeds. In its Top Speed mode, the car reaches the maximum speed of 420 km/h, limited for road use – however, this is by no means the end of the road for the Bugatti Chiron. With the new carbon fibre monocoque, a newly designed adaptive chassis, tyres developed especially for Bugatti and other innovative technologies, the Chiron is not only a champion in terms of maximum acceleration but is, for the first time, also an agile, modern Bugatti with handling that ensures maximum driving pleasure. The design of the Chiron combines significantly more “beast” with a very high level of “beauty”. The design language introduced by Bugatti with the Chiron has a significantly more aggressive tone and does justice to the character of the new super sports car. The designers have succeeded in reinterpreting Bugatti’s DNA with its distinctive features in a modern manifestation at the same time as adding new features resulting from the technical demands of even higher performance. The Chiron remains unmistakably a Bugatti. Customers’ reactions show that Bugatti has hit the mark. Advance orders have already been received for one third of the production series. “Those who have already considered Bugatti and its unique features in connection with the purchase of a Veyron will find there is no way they can ignore the Chiron,” according to Wolfgang Dürheimer. “With the Chiron we will not only be providing a key emotional element for the image of the Volkswagen Group but will also be making a positive contribution to Group results,” says Wolfgang Dürheimer. The Chiron can be seen on the Bugatti stand in Hall 1 at the Geneva International Motor Show from March 1 to 13. 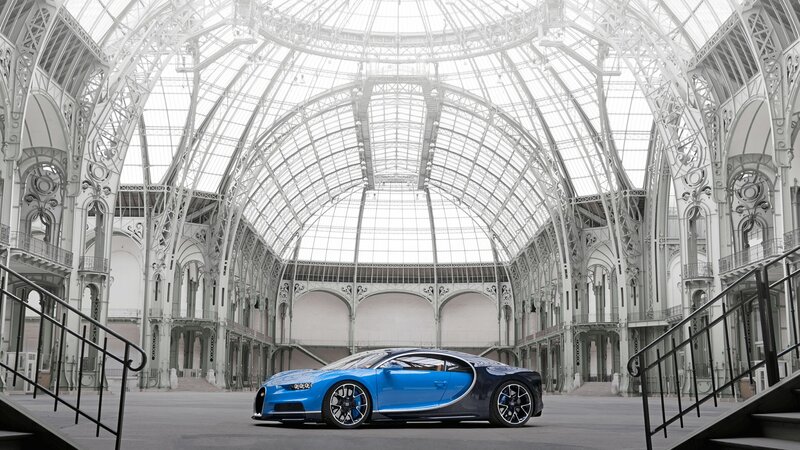 The Bugatti Chiron at the Grand Palais, Paris. The interior reflects the stylistic themes of the exterior. The newly developed rear end with the innovative rear light creates the distinctive signature of the Chiron. In its Top Speed mode, the Chiron reaches the maximum speed of 420 km/h, limited for road use – however, this is by no means the end of the road for this super sports car. With torque of 1,600 Nm between 2,000 and 6,000 rpm, the Chiron offers maximum performance with outstanding control. The Bugatti Chiron at the headquarters of the long-standing brand in Molsheim (France).